Showing people how to cheat is frowned upon by Studio Wildcard, but these exploits have been around for years. So naturally, Luke framed his video as a dulcet nature documentary. 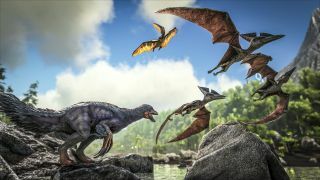 "Mesh monkeys," he said, are the vile, regrettable creatures who populate the server blades of Ark: Survival Evolved and muck up the multiplayer with cheap tricks that ruin the experience for everyone else. "Today, we're going to explore the mesh monkeys, and the techniques they use to supersede base defenses," he says. For the next 10 minutes, Luke methodically unveiled a few of the tried-and-true exploits that have existed in the game code, he says, since the game released back in 2017. They include a clever server-relog that puts your character out-of-bounds, a hidey-hole in the top corner of a map that you can clip through easily, and a wall that can be rammed through with a jetpack. Luke mentions that he found all of those exploits with a simple YouTube search, and adds, "Why can't the devs fix this themselves?" When I reached out to Studio Wildcard, the company behind Ark, they directed me to a statement they made on the forums shortly after the Reddit indignation. In it, they announced that H.O.D. would be formally unbanned, but also didn't fully exonerate Luke's content. "Any issue that violates our Code of Conduct is subject to a fair appeal process. When things land in the gray area, our first instinct is to do whatever is in our power to prevent abuse," it read. "Upon further review of the situation involving H.O.D Gaming, we felt that it was not deserving of a permanent ban. Videos showing exploit techniques are admittedly a gray area when it comes to enforcement, which is just one of the reasons why the appeal process exists for bans." This is fairly standard for a lot of publishers. You can find plenty of examples of prominent streamers earning bans after taking advantage of an exploit or an oversight. It's happened in PUBG, Overwatch, and most recently in Anthem. The difference for H.O.D. is that he claims the meshing he demonstrated happened in Ark's single-player mode, and also that the overall directive of his video was cached as a form of protest. I asked him what his response would be if Wildcard informed him that achieving exploits, regardless of the overarching context, was a no-questions-asked bannable offense. "I [would] respond that I deserve the ban for exposing these exploits, but sacrifices have to be made. It's the only way to bring enough attention to them to actually get them fixed," he wrote. These exploits have been in the game for far too long and have becoming widely accepted as a norm." Your mileage on this controversy will depend on how effective you think H.O.D. Gaming's protest was, or if you think it introduced a whole new group of people to some of Ark's more fragile invisible walls. One thing is clear though; fixing the exploits would solve all of these problems, all at once. The simplest answer is usually the right one.